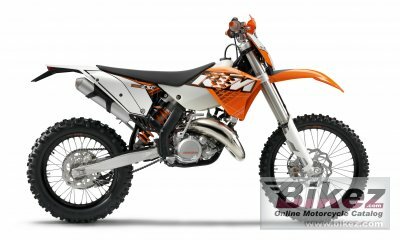 2011 KTM 125 EXC. Picture credits - KTM. Submit more pictures. The 125 EXC starts the new season with even more optimisations. With its well-known powerful engine, new frame design and improved chassis, it faces down the competition in the E1 class. A great example of simple two-stroke technology with superior power and minimal weight. It�s never been so easy to be �ready to race�! Comments: A racing tuned version called ECX SIXDAYS is available. Ask questions Join the 11 KTM 125 EXC discussion group or the general KTM discussion group. Bikez has discussion forums for every bike. View comments, questions and answers at the 2011 KTM 125 EXC discussion group. You can sign up for e-mail notifications when other riders answer you. If you have extensive experience with the MC, please send us a review. If you consider buying this bike, you should view the list of related motorbikes Look at photos. Compare technical specs. And check out the rating of the bike's engine performance, reliability, repair costs, etc. You can compare the rating with other bikes.